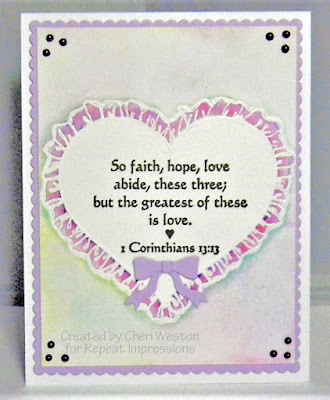 There's a new inspiration challenge at The House That Stamps Built and here it is. Gorgeous isn't it? Whatever it is that inspires you from this image, (the colors, the texture, the image itself...) go with it and enter our challenge. You will be entered in the end of the month drawing for a $25.00 gift certificate for Repeat Impressions stamps. I was inspired by the colors, and I used watercoloring to try and bring them to the background of this card. The colors are much better in person. However, I was also inspired by the texture and used the RI Stamp #1216-O "Ruffled Heart Border" to show that. The sentiment is RI#1211-J "So Faith". For more great ideas for inspiration check out my team mates....their projects are amazing. We all hope you get an opportunity to play along. You can get all the details at The House. I'm so happy you stopped by. If you love RI stamps as much as I do, grab my code rr10cw for a 10% discount and enjoy. Cheri- This is gorgeous. Wonderful job! Great take on the challenge Cheri, like how you highlighted the sentiment and those gems in the corners! 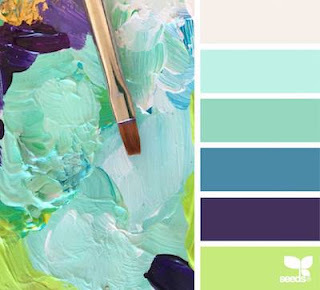 So pretty - love these inspiration challenges - so many different interpretations. Love the ruffled heart. Beautiful! I'm so glad someone else saw the purple in the inspiration photo; I thought maybe I was imagining something. : ) Love your soft background; so pretty. You are the watercoloring, mixed media queen! Your cards always amaze me! Beautifully done, dear friend! Gorgeous colours, inspiration and gorgeous take SS. Of course there is purple there! I've got purple in mine - off to finish it. Great job on this challenge. Love the ruffled heart!